From marginal gains and total teamwork, to succession planning and ruthless prioritisation it’s all there for businesses to learn from. “The cumulative effect of marginal gains” is a philosophy that revolutionised British cycling and sport in general. Introduced by the team’s performance director Dave Brailsford for London 2012, the concept focuses on the idea that making lots of small, incremental changes can add up to a big difference. Every individual aspect of what it takes to win a race is broken down into its component parts: from the position of seams of the speed suits, to the impact of excess dust in the mechanics work areas. All assumptions are challenged and re-evaluated to see where the smallest improvements can be made and therefore, advantages gained. Time and time again throughout the Olympics we saw people playing and working hard for each other to achieve the collective goal. 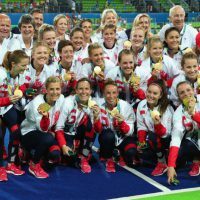 In the woman’s hockey we see a brilliant example of how a team pulled together to overcome the world champions Netherlands to win Gold for the first time. Sir Bradley Wiggins also talked about a ‘Total Team’ mentality, commenting there were ‘no star players in their pursuit of excellence’, just the right people with the right skill set to achieve the task in hand i.e. Winning gold medals. Other countries have questioned how, after a poor showing at the World Championships in March, Team GB’s cycling team have dominated at the Olympics. The answer is far from sinister and comes down to one thing; ruthless prioritisation. With the £30 million funding the team receive from the National Lottery solely dependent on their success at the Olympics, winning at the World Championships was deemed unimportant and all focus and resources directed at Rio instead. The BOA (British Olympic Association) has been equally ruthless in its allocation of lottery funds to other sports, investing heavily in the sports or ‘core products’ Team GB has been historically good in (rowing, cycling, athletics) to create a solid base and cutting funding from sports and athletes that don’t deliver. With this ruthless prioritisation what sectors of business should we focus on post Brexit? Where are we world class? In my view there is a real opportunity to invest more in the Mid Market sector. Those companies that have the aptitude to Scale Up and create significant growth as well as job creation. Time and again UK medal winners at the 2016 Olympics thanked ‘the team’ that helped them, and by ‘the team’ they meant not just fellow athletes but the host of others who now work with sportspeople to improve their performance and win medals and trophies. Some of these have always been there, such as the trainer or the coach, but these days one can add sports psychologists, nutritionists, equipment technologists, data gathers and analysts, and a host of other specialists. Double Olympic champions Helen Glover and Heather Stanning dedicated their second Olympic gold to their coach Robin Williams. Andy Murray has seen a huge impact in his performance through having Ivan Lendl as his coach. There is now a real opportunity for businesses who want to achieve their very best to think clearly about the composition of their support team, including the right business coaches, accountants, mentors and wealth managers. With its 4-year cycle, the Olympics provide athletes with a set of clearly defined targets and one unambiguous goal: to win a gold medal. It is this simple clarity and singularity of purpose that helps drive and motivate athletes to compete. Constantly monitored and assessed, they are kept on track to ensure they are capable of achieving their goal. For Team GB, the power of the shared goal was also a key motivator, with medal winners time and time again referencing not only their joy at their individual success but also in contributing to team’s overall medal target. How often do you review your Strategy? What is your Big Hairy Audacious Goal (BHAG) ? Do you set down 90 day goals to ensure that you have clear deliverables on a quarterly basis that are moving you forward to achieving your strategic priorities? Once your strategy is in place it can be all too easy to get distracted, especially by the competition. After winning gold in the team pursuit, Sir Bradley Wiggins said to win, the team simply had to ‘work their plan’ regardless of what their opposition were doing. Lesson 7: Get up when you fall down. Quite literally in the case of Mo Farrah who fought back from a fall to retain his gold medal. The ability to bounce back and view failure as an opportunity is a key trait of successful athletes. After missing Beijing in 2008 due to stress fractures in her right foot, Heptathlete Jessica Ennis-Hill retrained herself to take off for the long jump on her left foot, while rower Katherine Grainger called her silver in Rio her “adversity medal” after returning to rowing post-London gold after a 2-year break. Even athletes, like Tom Daley and Lutalo Muhammad whose Olympics didn’t quite go to plan, showed their resilience and fighting spirit, by immediately vowing to learn from the experience and succeed in Tokyo 2020. One thing that became very apparent in Rio is the success of one can drive the success of others. Although Team GB got off to a slow start, once the medals did start coming the whole team’s confidence just grew and grew. As well as medal winning performances from established Olympians like Mo Farrah, Laura Trott and Jason Kenny, Team GB claimed medals in a number of new events including trampolining, diving and women’s triathlon, rugby sevens and golf. In fact, Team GB won more gold medals (16) across more sports than any other country, surpassing the overall target in the process. Investing in new talent and the next generation has been a key factor in Team GB’s success and resulted in improved performances for the last five Olympic Games. Succession planning has ensured the retirement of Olympic legends like Sir Steve Redgrave from rowing and Sir Chris Hoy from cycling have not meant an end to winning but rather inspired others to drive it further. Likewise, gymnast Max Whitlock (22), track cyclist, Becky James (23) and Swimmer Siobhan-Marie O’Connor (20) are all Rio medalists who have emerged from Team GB’s Talent Identification Programme that finds and nurtures the next generation of Olympians. Andy Murray, Sir Bradley Wiggins, Mo Farrah and Jessica Ennis-Hill; what links these athletes (apart from winning) is that they are authentic and real; they are driven, passionate, have experienced victory and defeat, they speak their minds and are true to themselves. What you see is what you get and it is because of this they are able to inspire and lead others. However, there is perhaps one Olympian who above all others personifies authenticity and self-belief and that is of course, the triple-triple gold-winning Olympic god, Usain Bolt*. His laid-back confidence and playful antics, along with his unbelievable talent, have turned him into one of the world’s most loved and inspiring athletes. *Yes I know he’s Jamaican but you can’t talk Olympic success and not mention Usain Bolt can you? These are the lessons that business Britain needs to learn from Team GB’s success in Rio if it wants to beat the world and, post-Brexit, be ‘faster, higher, stronger’ than the rest. « In the middle of every difficulty lies opportunity	» What are the six crucial players that are required for a successful Scale-up ecosystem?